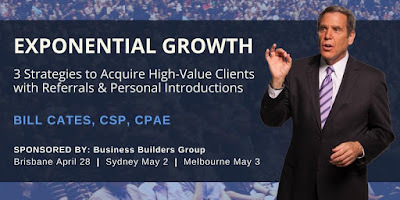 We are delighted to host Bill Cates at our BBG Gala Breakfast Forum's in Sydney, Melbourne and Brisbane next Week. There are only a few places available , and we are releasing 10 tickets in Brisbane and Melbourne, (Sydney full). Be sure to enter the promo code is BBG1701 to get your complimentary seat. Below is a great snippet of Bill Cates telling us the 3 words to handle objections and get more referrals. Here at BBG, we support one another's business growth through lead generation and warm referrals. It has thus far been incredibly succesful and has expanded rapidly.